Hello lovelies so a couple of weekends ago starting from a Thursday night, my partner actually had Friday to Sunday of work and after years of wanting the wood panelled ceiling painted white he finally said we could do it! Bless him taking his days of to re decorate and splurge we got stuck in, all together the room cost about £300-£350 to do as we got new carpet, paint and new toy storage. 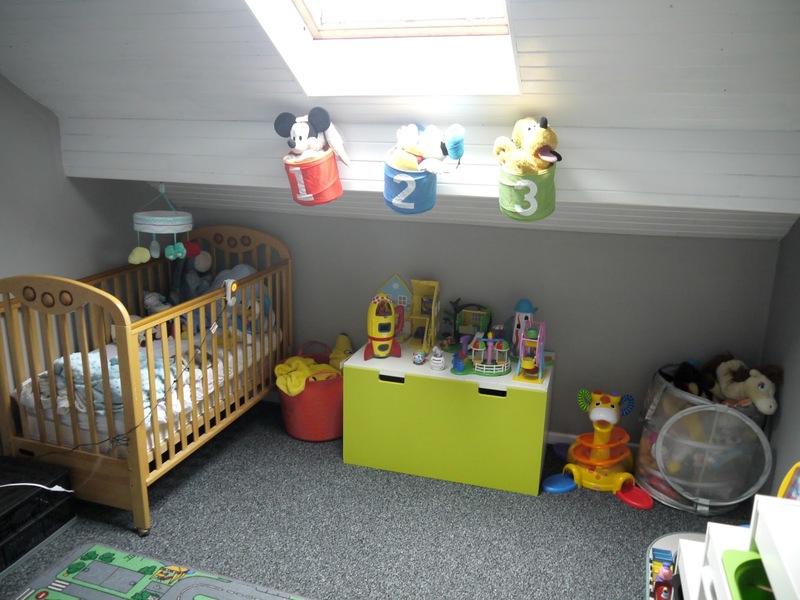 You could re design your childs room for a lot cheaper but it needed it! It was very dated carpet as the house we live in actually belonged to Dan's nan and granddad so as you can guess the carpet wasn't modern at all, so we ripped that out and started fresh. 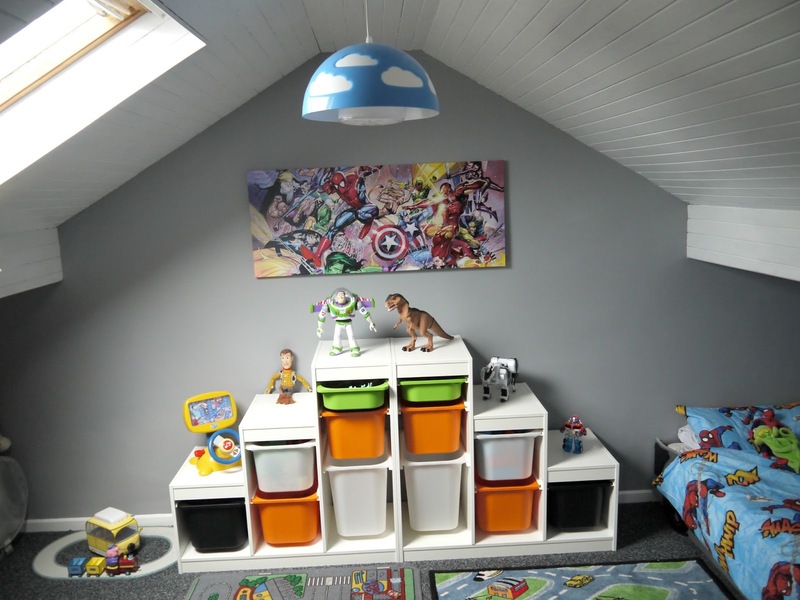 We had to sand down all the wood panelled ceiling with a little help from my friend Jess and Dan doing most of the hard work then painted it white, I felt like grey would look nice in the boys room as I don't think it will need doing again as they get older, perfect colour for all ages. 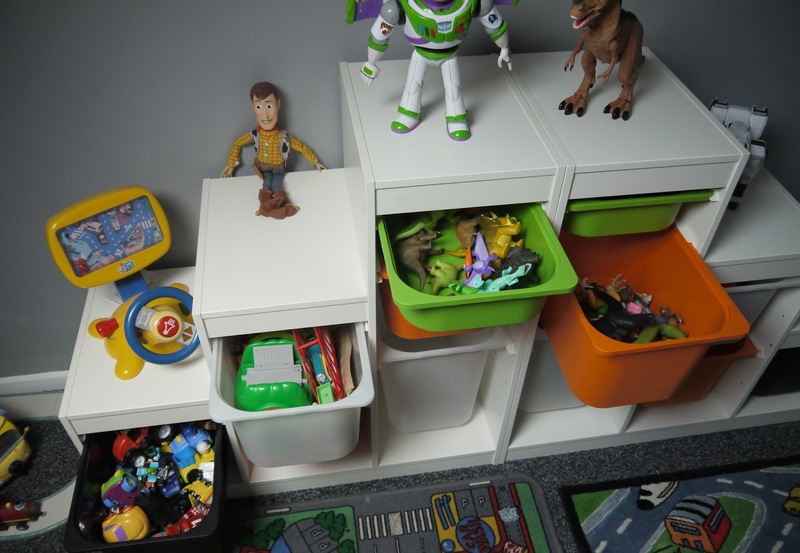 We went to Ikea to get all the new storage we decided to choose the Trofast design with different colour buckets as we thought this worked best to store all the toys away, I've given all his toys there own homes e.g. cars in one bucket, dinosaurs in another, lego bricks in one etc. We also picked up these cool green shelving units that you can stuff anything inside or like we have done toys on top! It just adds a bit of something to the room, it looks quite funky. 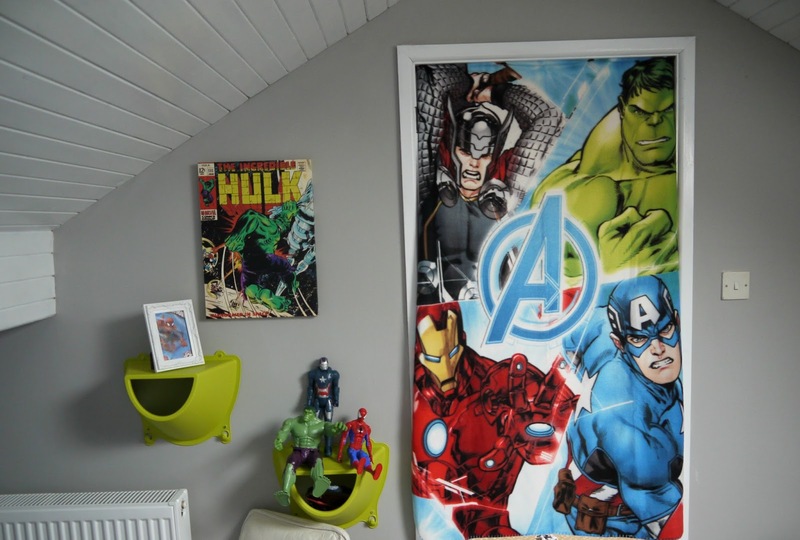 Then Dan had the idea of putting the Avengers fleece up and removing the door! I wasn't keen at first then I thought why not, it's something different and the room next to them is a play room anyway so easy to get into and no trapped fingers in doors! As Lawson gets older we will have to put a stair gate on but there is one at the top of the stairs anyway. 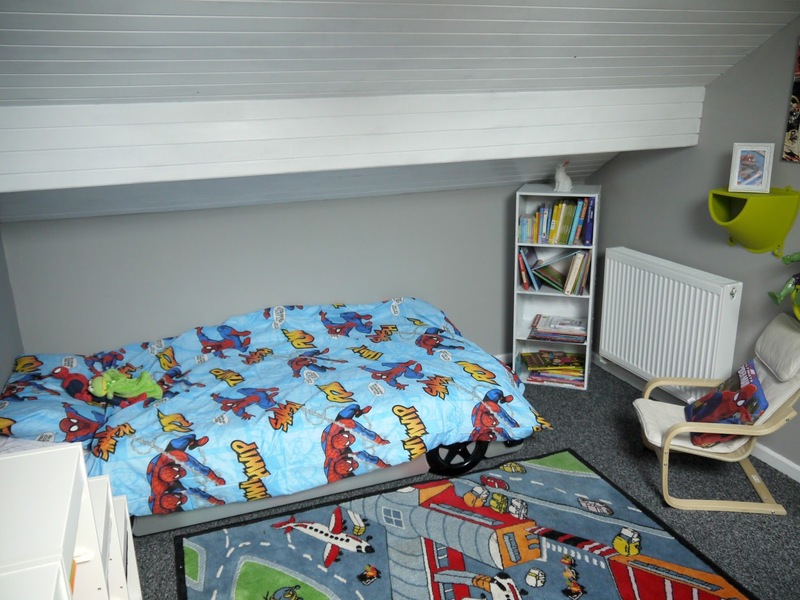 We got the marvel canvases at a carboot of all places, I think there great most of the little bits around are Ikea, new bedding from B&M along with the fleece and spiderman cushion and I painted some old furniture to go with the new decor. Me and Dan are thoroughly happy how the room turned out and more importantly so are the kids! Plenty of room to play in and its all stored away tidy, Oscar has learnt that when he has played with something to put it back in the right bucket before he gets another toy out and it's working so far. 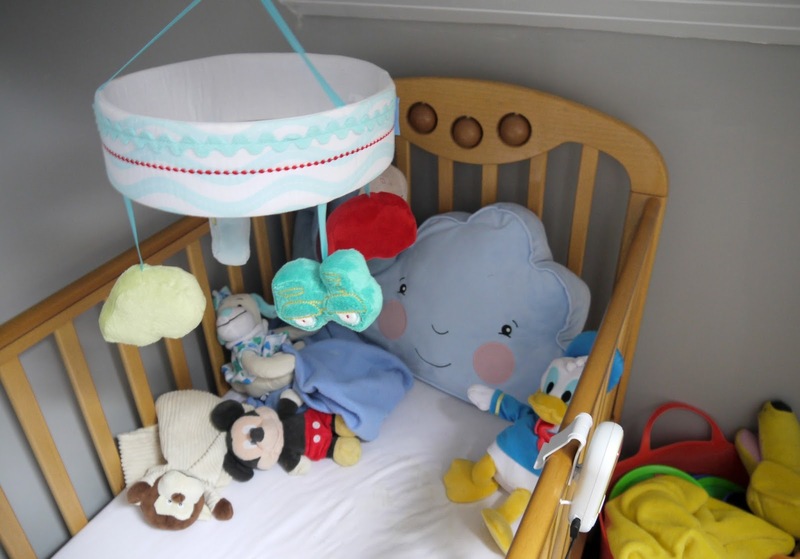 We stupidly forgot to take a before picture but if you seen in this old blog post you can see the wooden panelling and the dated carpet 'Old nursery' ! As much as it was hard work it was fun and all worth it when you see the finished results, it just makes me want to change all the rooms now but were going through mortgaging the house at the minute then getting an extension so will have to wait a while but I can't wait for it all to be done. Has this inspired you to change your room?